*Special Use Permits with the U.S. Forest Service Lake Tahoe Basin Management Unit, which authorizes Lake of the Sky Weddings to conduct wedding ceremonies at specific locations on public land. Regan Beach provides a year round wedding location in South Lake Tahoe, California. This ceremony location is centrally located and easy to reach for you and your wedding guests. With one of the most romantic settings that the lake has to offer it is the perfect spot for stunning sunset photos. Regan Beach Park is located on the west end of El Dorado Beach in South Lake Tahoe. With a lush grassy park above a sandy beach there are breathtaking views of the crystal blue waters of Lake Tahoe. The park is home to old growth Jeffry Pine trees that are over 100 years old, imagine being married under the shelter of some of Lake Tahoe's grandest trees with the brilliant blue lake as your backdrop. Emerald Bay is world famous for its natural beauty. And during the summer months, weddings by the beach are just gorgeous. 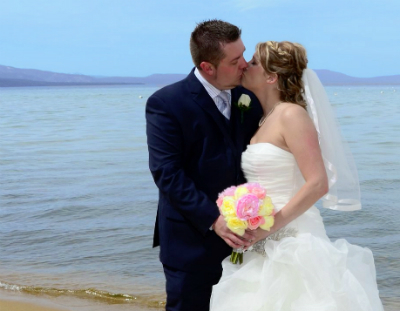 Who could ask for anything more perfect than a beach side wedding at Lake Tahoe? In the autumn, consider a ceremony surrounded by trees to bring all of the fall color into your photographs. During the winter season, our incredible snow capped mountains and the mirror waters of Lake Tahoe make for a perfect ceremonial backdrop, whether you are dressed in formal wedding gown and tuxedo or in snow clothes as you navigate the slopes. Whatever your choice of location and season, we can accommodate you and we guarantee that your photographs will be beautiful and will bring back the memories of your special day for years to come! Heavenly Valley For those that wish to be married with heavenly views of Lake Tahoe and the Sierra Nevada mountains we can offer spectacular weddings at Heavenly Ski resort. Whether on skis in the winter or on the observation deck in the summer you will be surrounded by majestic mountains and our crystal blue lake beneath you during your wedding. Sacred Cove - The Sacred Cove is a beautiful location for a wedding any time of year. 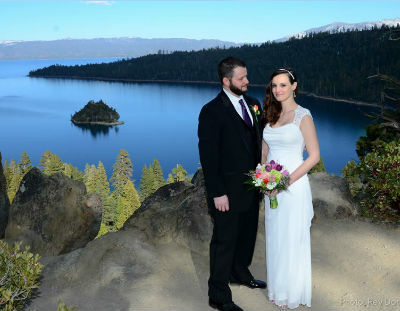 Equipped with easy access to pristine Lake Tahoe and an incredible view and private ambiance, Sacred Cove is ideal for a unique wedding with many opportunities for spectacular photographs and memorable moments. Because it's close to the lake, Sacred Cove is protected from the wind noise of surrounding areas. Tahoe Paradise Park is located in Meyers (the south shore of Lake Tahoe) on Lake Baron, a man made lake next to the Truckee River. The majestic views of the Sierra Nevada will astound you. There is a beautiful redwood Gazebo underneath a giant elderly pine. In addition to the gazebo, there is a clubhouse with barbecue spit, or a riverside park with barbecues, benches, playground, softball fields, and hikes through the woods along the river. Up to 150 guests can be accommodated (chairs may be rented at this location for an additional fee) for Tahoe Paradise Park weddings. The clubhouse is available for receptions and can be reserved through the Tahoe Paradise Park manager. Lake Tahoe Wedding locations that sparkle! beach side wedding at Lake Tahoe? 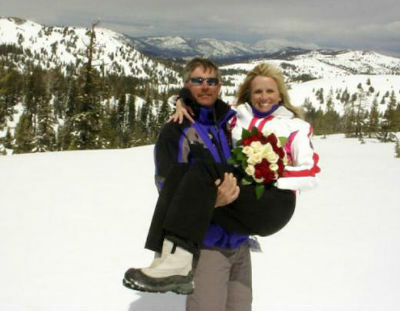 How about overlooking Heavenly Valley as you say your vows on skis? Prefer a small elopement on the pier of Timber Cove or maybe an extravagant event at Zephyr Cove? 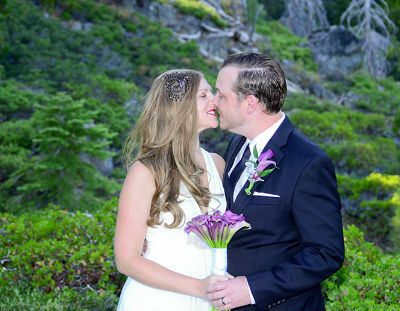 We can help make your dream wedding come true by booking the perfect Tahoe wedding venue. In the autumn, consider a ceremony surrounded by trees to bring all of the fall color into your photographs. During the winter season, our incredible snow capped mountains and the mirror waters of Lake Tahoe make for a perfect ceremonial backdrop, whether you are dressed in formal wedding gown and tuxedo or bundled up in snow gear as you ride the slopes. Our top of the line Tahoe Wedding package offers pampered limousine service in our white Lincoln wedding limo. Your chauffeur will pick up your party and take you on a delightful drive to your wedding event. The Minister, her photographer and staff, will meet & debark your party and lead you in a procession to your special ceremonial location. Everything required for a perfect, worry-free wedding will be provided by Lake of the Sky Weddings, including Wedding License and notary service, professional state-of-the-art digital photography, beautiful bridal bouquet, roses for the bridesmaids, boutonnieres for the Groom and his men, and more. The Newlyweds and their guests will then be whisked away for a champagne drive (non-alcoholic cider on offer as well) to the hotel, reception, or after-wedding destination of their choice.